"2016 MLS Cup" redirects here. For details on the tournament, see 2016 MLS Cup Playoffs. MLS Cup 2016 was the 21st edition of the MLS Cup, the championship game of Major League Soccer (MLS), which took place on December 10, 2016, at BMO Field in Toronto, Ontario, Canada. It was the second final to be hosted in Toronto, after 2010, and the first there since the cup transitioned away from neutral-site venues. The Seattle Sounders won the cup over Toronto FC in a penalty shoot-out that followed a 0–0 draw. The 2016 final was the first to be contested between two expansion teams and became the first in league history to end scoreless. Toronto FC became the first Canadian club to play in the MLS Cup, while Seattle won their first title. The title capped a comeback season for the Sounders, who replaced their manager during the middle of the season and climbed from second-to-last in the conference to a playoff spot. The MLS Cup is the post-season championship of Major League Soccer (MLS), a professional club soccer league in the United States and Canada. The 2016 season was the 21st in MLS history, and was contested by 20 teams in two conferences. Each club played 34 matches during the regular season from March to October, facing each team in the same conference at least twice and teams in the other conference at least once. The playoffs, running from October to December, were contested between the top six clubs in each conference and included four rounds: a one-match knockout round for the lowest-seeded teams, two rounds of home-and-away series, and the one-match final. The 2016 edition of the MLS Cup was the first to feature two expansion teams not part of the original clubs from the league's inception, with Toronto joining in 2007 and Seattle in 2009. For the first time since the 2008 edition, both teams in the final were making their first appearance. Toronto and Seattle faced each other once during the 2016 regular season, ending in a 1–1 draw at BMO Field on July 2. Toronto FC became the first Canadian club to qualify for the MLS Cup final, in their tenth season in Major League Soccer. After eight consecutive seasons without a playoff appearance, Toronto hired manager Greg Vanney, general manager Tim Bezbatchenko, and a trio of star players: American midfielder Michael Bradley, forward Jozy Altidore, and Italian playmaker Sebastian Giovinco. The 2015 season marked the first time Toronto had qualified for the playoffs, as Giovinco set a league record by scoring a combined 38 goals and assists on his way to being named the league's most valuable player. During the 2015–2016 offseason, Toronto acquired a new set of defensive players, including goalkeeper Clint Irwin, midfielder Will Johnson, and defenders Steven Beitashour and Drew Moor. The team started their first eight matches on the road as BMO Field had not finished renovation work, earning three wins and two draws and staying in a playoff position. Toronto slumped in May with a string of losses and draws, due in part to injuries to Altidore, Bradley, and Giovinco, but regained form in June with the reopening of BMO Field, capped off with a clinch of the Canadian Championship. Toronto lost only two of its final fifteen games, stretching from July to October, and qualified for the playoffs as the third seed in the Eastern Conference. Toronto hosted the Philadelphia Union in the single-match knockout round, winning 3–1 and advancing to a series against New York City FC. Toronto won the home leg 2–0, and then proceeded to win 5–0 in New York City, setting a record for largest margin of victory on aggregate. In the Eastern Conference final, Toronto would face their rival Montreal Impact in a bid to be the first Canadian team to play in the MLS Cup. During the first leg, played in front of a record crowd of 61,004 in Montreal and delayed 41 minutes due to mistakes in the field markings, the Impact took a 3–0 lead shortly after halftime. Toronto responded with two late goals, giving them a potential away goal advantage. The second leg, played in Toronto, ended 3–2 after 90 minutes and forced extra time, where Toronto would score two unanswered goals to win 5–2. The series, ending with a 7–5 aggregate win for Toronto, set a league record for most goals scored in a two-legged series. Sports journalists called it the most thrilling series in MLS history and an "instant classic", drawing comparisons to the Los Angeles–San Jose series in the 2003 playoffs. The Seattle Sounders had been in Major League Soccer for eight seasons, qualifying for the MLS Cup Playoffs each year. While they had won the Lamar Hunt U.S. Open Cup four times and the Supporters' Shield once, the Sounders never advanced further than the Western Conference Finals, which they reached on two previous occasions. The Sounders finished the 2015 season with a loss in the conference semifinals to FC Dallas and plans to retool their roster while chasing the "elusive" MLS Cup. During the offseason, the club signed young players Jordan Morris, a homegrown player from Stanford, and Joevin Jones from Chicago. The team also lost several key players, including star forward Obafemi Martins two weeks before the start of the regular season. The Sounders won only six of their twenty matches, leaving them second to last place in the Western Conference by late July. Manager Sigi Schmid left the club on July 26, and was replaced on an interim basis by assistant coach Brian Schmetzer. The team signed Uruguayan midfielder Nicolás Lodeiro and saw the return of defender Román Torres from a long-term injury, helping strengthen the team, but lost captain Clint Dempsey to a diagnosed heart condition that would prevent him from playing for the rest of the season. 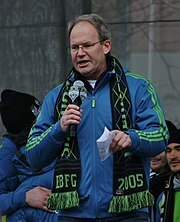 The Sounders went on to win eight of their final fourteen matches under Schmetzer, qualifying on the final matchday for the playoffs as the fourth place seed in the Western Conference. In the playoffs, the Sounders hosted Sporting Kansas City on October 27 in the single-match knockout round. The team won 1–0, off a headed goal in the 88th minute by Nelson Valdez, ending a personal scoring drought. Seattle advanced to the Conference Semifinals against FC Dallas, winning the home leg 3–0 and losing 2–1 away, for a 4–2 aggregate score. On November 27, the Sounders clinched their first Western Conference championship after a 3–1 aggregate win over the Colorado Rapids, after a 2–1 win at home and a 1–0 win in Colorado that came from a late goal by Morris, who was recovering from the flu. BMO Field was confirmed as the host of MLS Cup 2016 after Toronto FC won the Eastern Conference Championship, leaving them as the highest remaining seed. The stadium previously hosted MLS Cup 2010 as a neutral site, and had also hosted the 2008 MLS All-Star Game and the 2007 FIFA Under-20 World Cup. It was renovated prior to the 2016 season, adding additional seats and a roof to cover the stands at a cost of C$150 million. Maple Leaf Sports & Entertainment, the owners of BMO Field and Toronto FC, spent C$7 million on pitch maintenance for the 2016 season, in part due to the shared field with the Toronto Argonauts of the Canadian Football League (CFL). During the season, a temporary upper grandstand was built in the south end, originally to accommodate larger crowds for the CFL's 104th Grey Cup (which took place prior to the MLS Cup) and the National Hockey League's Centennial Classic (which was played after the MLS championship game). The club subsequently confirmed that the temporary seats would be made available to soccer fans if Toronto qualified for any playoff games that took place after the CFL championship game (specifically, the Eastern Conference Final and the MLS Cup). With the temporary seats, the stadium's capacity in its soccer configuration is about 36,000. The Toronto Transit Commission and GO Transit announced increased service on bus and train routes to BMO Field on the night of the final. Tickets for the match were divided into several blocs for allocation. A pre-sale event a week before the cup final sold 20,000 seats to existing season ticket holders, based on seniority; the sale did not guarantee similar seats to their season tickets, causing fans to complain on social media. A public sale on December 5 sold out 9,000 tickets, which quickly appeared on secondary markets for well above face value. An additional 5,000 seats were allocated to MLS, including 1,500 tickets for traveling supporters from Seattle. The 2016 final was broadcast by Fox Sports on terrestrial television in the United States, for the first time since 2008. The match was also carried by UniMás on terrestrial television and ESPN Deportes Radio on terrestrial radio in Spanish within the United States. Sirius XM broadcast the match on satellite radio in the United States. In Canada, the match was broadcast in English by TSN and in French by RDS. The MLS Cup was broadcast internationally by Fox Sports in Latin America and Africa, ESPN Brasil in Brazil, Sky Sports in the United Kingdom, Eurosport in Europe, and BeIN Sports in southeastern Asia and Australia. Fox and TSN broadcast pre-game shows on their respective networks, in addition to regular coverage. Fox also broadcast the MLS Cup using a virtual reality app for the first time. The 2016 final set a new record for Major League Soccer viewership, with a total of 3.5 million viewers across all channels. Fox's broadcast reached 1.4 million viewers and was the most-watched English language broadcast of the MLS Cup in the United States since 2001. The Spanish-language broadcast on UniMás had an average 601,000 viewers. In Canada, an estimated audience of 1.5 million viewers watched the match on TSN and RDS, setting a new MLS record. The Seattle–Tacoma television market generated a 9.9 household rating for the match. The match kicked off at 8:16 p.m. Eastern Time at BMO Field in Toronto, Ontario, Canada, where the ground temperature was reported as −5 °C (23 °F) and estimated at −12 °C (10 °F) with wind chill. Alan Kelly was the head referee and his assistants were Frank Anderson, Joe Fletcher, Allen Chapman, and Danny Thornberry. Kelly and Anderson had been named the 2016 MLS Referee of the Year and the 2016 MLS Assistant Referee of the year, respectively, for their regular season performances. During the first half, Toronto had the majority of possession and seven chances at goal, but were unable to score. Several hard tackles between players resulted in fouls being called and arguments, but no bookings from referee Alan Kelly. The second half began with a major chance for Toronto's Sebastian Giovinco, who hit the side netting on an attempt at goal. Two Seattle players, Nelson Valdez and Erik Friberg, were substituted after suffering minor injuries. The rest of the half saw missed passes and touches from Toronto, along with a steadfast Seattle defense that let the match head into extra time at 0–0. The first half of extra time remained scoreless, with Giovinco replaced by Tosaint Ricketts after suffering from a cramp. By the second half, both teams had exhausted their available substitutes. In the 108th minute, Seattle goalkeeper Stefan Frei made a crucial save on a header from Jozy Altidore, using his body to spring his left hand onto the ball; Frei would record seven total saves and be named the game's most valuable player for his efforts. The second half of extra time drew to a close after more than 120 minutes of play, with Seattle failing to register a single shot on goal. The penalty shoot-out began with Toronto's Jozy Altidore, who scored his attempt. After the first two rounds, including a miss from Toronto's Michael Bradley, Seattle had a 2–1 lead. Seattle's Álvaro Fernández missed his shot in the third round, leading to a tie that would persist until the end of the first five rounds. During the sudden death rounds, Toronto's Justin Morrow missed his penalty, letting it hit the crossbar of the goal. Seattle defender Román Torres scored in the following attempt, winning the shoot-out and cup for Seattle 5–4, their first ever MLS Cup title. With their cup win, Seattle Sounders FC became the first MLS club to not register a shot on goal during regular play, surpassing the record of one shot the club set earlier in the season against Sporting Kansas City. 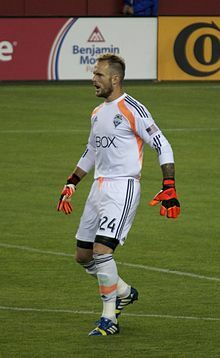 Stefan Frei, who was traded from Toronto to Seattle three years to the day of the final, was awarded the MLS Cup Most Valuable Player award for his shutout and penalty saves. The team's comeback performance under new head coach Brian Schmetzer, from second-to-last in the conference to MLS Cup champions, was called the most stunning turnaround in MLS history and a "cinderella season". The season was voted the Sports Story of the Year in a public contest held by Sportspress Northwest. The Sounders earned a berth into the 2018 CONCACAF Champions League, their first since the 2015–16 edition. Toronto earned a berth into the same competition by winning the 2017 Canadian Championship; the team was ineligible from qualifying for the competition through an MLS Cup win due to confederation rules. As MLS Cup winners, the Sounders received a prize of $275,000, while Toronto were awarded $80,000 as runners-up. Both teams would later qualify for MLS Cup 2017, setting up a rematch at BMO Field that was won by Toronto. The Sounders celebrated their first MLS Cup with a parade in Seattle on December 13 from Westlake Park to a rally at the Seattle Center, adjacent to the Sounders' first home stadium at Memorial Stadium; the parade and rally were attended by an estimated 10,000 fans. ^ a b "PRO names Alan Kelly man in the middle for 2016 MLS Cup Final". MLSsoccer.com. November 29, 2016. Archived from the original on December 1, 2016. Retrieved November 30, 2016. ^ "MLS Announces 2016 Home Openers for all 20 Clubs" (Press release). Major League Soccer. December 22, 2015. Archived from the original on February 6, 2017. Retrieved February 5, 2017. ^ "2016 Major League Soccer Competition Guidelines". Major League Soccer. Archived from the original on March 17, 2014. Retrieved February 5, 2017. ^ Murray, Caitlin (December 14, 2016). "Toronto FC vs Seattle Sounders is the best MLS Cup matchup you could ask for". Fox Sports. Archived from the original on February 6, 2017. Retrieved February 5, 2017. ^ DelGallo, Alicia (December 7, 2016). "MLS Cup features firsts, highlights importance of designated players". Orlando Sentinel. Archived from the original on January 1, 2018. Retrieved December 31, 2017. ^ "2016 MLS Cup Game Guide". Major League Soccer. Retrieved February 5, 2017. ^ Baer, Benjamin (November 30, 2016). "Toronto FC, Seattle Sounders to face off in MLS Cup 2016". MLSsoccer.com. Archived from the original on December 3, 2016. Retrieved February 5, 2017. ^ a b c Parker, Graham (December 10, 2016). "After years of waiting, Toronto and Seattle get their shot at MLS glory". The Guardian. Archived from the original on December 10, 2016. Retrieved December 10, 2016. ^ Davidson, Neil (May 2, 2017). "Toronto FC coach Greg Vanney to celebrate his 100th game in charge". The Globe and Mail. The Canadian Press. Archived from the original on May 16, 2017. Retrieved December 1, 2017. ^ "Toronto FC's Giovinco named most valuable player in MLS". Reuters. December 2, 2015. Archived from the original on December 1, 2017. Retrieved December 1, 2017. ^ Davidson, Neil (July 31, 2017). "Veteran defender Drew Moor part of the glue that binds Toronto FC". The Globe and Mail. The Canadian Press. Archived from the original on August 6, 2017. Retrieved December 1, 2017. ^ Bell, Arch (December 8, 2016). "Toronto vs. Seattle: Everything you need to know about MLS Cup". ESPN. Archived from the original on December 2, 2017. Retrieved December 1, 2017. ^ Stejskal, Sam (December 10, 2016). "How'd they get here? Toronto FC make history on the path to MLS Cup". MLSsoccer.com. Archived from the original on December 12, 2016. Retrieved December 1, 2017. ^ "Toronto FC wins regular season finale, unable to clinch playoff bye". CBC Sports. October 23, 2016. Archived from the original on December 1, 2017. Retrieved December 1, 2017. ^ Parker, Graham (December 11, 2016). "MLS playoffs review: Gritty Seattle's improbable run to winning MLS Cup". ESPN. Archived from the original on December 1, 2017. Retrieved December 1, 2017. ^ Davidson, Neil (November 6, 2016). "Giovinco propels TFC to all-Canadian Eastern final". CBC Sports. The Canadian Press. Archived from the original on December 19, 2017. Retrieved December 1, 2017. ^ Armstrong, Laura (November 22, 2016). "Impact get a leg up on TFC in MLS East final". Toronto Star. Archived from the original on December 1, 2017. Retrieved December 1, 2017. ^ a b Straus, Brian (November 30, 2016). "Toronto FC reaches first MLS Cup after conference final classic vs. Montreal". Sports Illustrated. Archived from the original on December 1, 2017. Retrieved December 1, 2017. ^ Lutz, Tom (November 30, 2016). "Toronto FC reach first MLS Cup after surging past Montreal in extra-time". The Guardian. Archived from the original on December 1, 2017. Retrieved December 1, 2017. ^ McIntyre, Doug (December 1, 2016). "Title-starved Toronto beats Impact in instant classic to advance to MLS Cup". ESPN. Archived from the original on December 1, 2017. Retrieved December 1, 2016. ^ Goff, Steven (December 9, 2016). "In MLS Cup, Toronto FC and Seattle Sounders embrace cold weather and hot expectations". The Washington Post. Archived from the original on August 8, 2017. Retrieved August 7, 2017. ^ Pentz, Matt (November 19, 2015). "Seattle Sounders coach Sigi Schmid 'appreciative' to return but wasn't concerned about losing job". The Seattle Times. p. C2. Archived from the original on December 1, 2017. Retrieved November 29, 2017. ^ Pentz, Matt (January 26, 2016). "Joevin Jones isn't Sounders' biggest new name, but he'll be a critical addition". The Seattle Times. p. C3. Archived from the original on December 1, 2017. Retrieved November 29, 2017. ^ Goff, Steven (February 23, 2016). "MLS news and notes: Details begin to emerge about Obafemi Martins' move to China". The Washington Post. Archived from the original on December 1, 2017. Retrieved November 29, 2017. ^ Pentz, Matt (July 31, 2016). "What's next for Sounders?". The Seattle Times. p. C1. Archived from the original on December 1, 2017. Retrieved November 29, 2017. ^ Pentz, Matt (September 12, 2016). "Torres has presence on, off field". The Seattle Times. p. D2. Archived from the original on December 1, 2017. Retrieved November 29, 2017. ^ Dorsendahl, Glenn (February 26, 2017). "Seattle Sounders complete dramatic come-from-behind season by beating Toronto FC to win their first Major League Soccer championship on December 10, 2016". HistoryLink. Archived from the original on December 1, 2017. Retrieved November 29, 2017. ^ Stone, Larry (October 24, 2016). "As Sounders always have under coach Brian Schmetzer, they find a way". The Seattle Times. p. D5. Archived from the original on December 1, 2017. Retrieved November 29, 2017. ^ Pentz, Matt (October 24, 2016). "Sounders wrap up eventful season where they always wrap it up — the MLS playoffs". The Seattle Times. p. D5. Archived from the original on December 1, 2017. Retrieved November 29, 2017. ^ Pentz, Matt (October 28, 2016). "Nelson Valdez ends yearlong scoring drought just in time to advance Sounders in MLS playoffs". The Seattle Times. p. C2. Archived from the original on December 1, 2017. Retrieved November 30, 2017. ^ "MLS playoffs: Sounders advance to West finals; Impact to play Toronto FC for East title". The Los Angeles Times. Associated Press. November 6, 2016. Retrieved November 30, 2017. ^ Strauss, Brian (November 27, 2016). "Seattle Sounders advance to first MLS Cup after beating Colorado Rapids". Sports Illustrated. Archived from the original on December 1, 2017. Retrieved November 30, 2017. ^ Pentz, Matt (November 30, 2016). "Toronto defeats Montreal in Eastern Conference final, will host Sounders for MLS Cup". The Seattle Times. Archived from the original on December 1, 2017. Retrieved December 1, 2017. ^ Stejskal, Sam (December 8, 2016). "BMO Field 101: Toronto FC's stadium set to host MLS Cup after facelift". MLSsoccer.com. Archived from the original on December 11, 2016. Retrieved December 1, 2017. ^ Larson, Kurtis (May 5, 2016). "'A whole new stadium': Take a look at renovated BMO Field ahead of Toronto FC home opener". National Post. Archived from the original on May 9, 2016. Retrieved November 30, 2016. ^ Armstrong, Laura (November 26, 2016). "BMO Field's grass whisperer silences skeptics". Toronto Star. Archived from the original on December 2, 2016. Retrieved November 30, 2016. ^ Davidson, Neil (November 30, 2016). "Toronto FC and Montreal Impact take to BMO Field in bid for MLS Cup final". Global News. The Canadian Press. Archived from the original on December 2, 2016. Retrieved December 4, 2016. ^ Armstrong, Laura (November 29, 2016). "TFC knows the score, and 1-0 would be just fine". Toronto Star. Archived from the original on December 20, 2016. Retrieved December 4, 2016. ^ Fox, Chris (December 10, 2016). "TTC and Metrolinx boosting transit due to MLS Cup". CTV Toronto. Archived from the original on December 1, 2017. Retrieved November 29, 2017. ^ Pelley, Lauren (December 2, 2016). "TFC season ticket holders frustrated by lack of reserved seats for MLS Cup". CBC News. Archived from the original on December 28, 2016. Retrieved December 1, 2017. ^ Larson, Kurt (December 5, 2016). "Toronto FC's MLS Cup match sells out in minutes". Toronto Sun. Archived from the original on December 1, 2017. Retrieved November 30, 2017. ^ "MLS Cup set for Primetime on FOX, UniMás, TSN and RDS, December 10" (Press release). Major League Soccer. September 6, 2016. Archived from the original on December 1, 2016. Retrieved November 30, 2016. ^ a b c "How to watch, stream and listen to MLS Cup 2016". MLSsoccer.com. December 8, 2016. Archived from the original on December 10, 2016. Retrieved December 10, 2016. ^ Soper, Taylor (December 7, 2016). "FOX to broadcast MLS Cup in virtual reality for first time with new custom replay feature". GeekWire. Archived from the original on December 9, 2016. Retrieved December 7, 2016. ^ a b "2016 MLS Cup is Most-Watched Championship Game in League History" (Press release). Major League Soccer. December 13, 2016. Archived from the original on December 17, 2016. Retrieved December 13, 2016. ^ "Toronto FC Breaks All-Time Audience Record Yet Again, with 1.5 Million Viewers Tuning in to the MLS CUP 2016 on TSN and RDS" (Press release). Bell Media. December 12, 2016. Archived from the original on December 12, 2016. Retrieved December 12, 2016. ^ a b c d Parker, Graham (December 10, 2016). "Seattle Sounders hold nerve in shootout to clinch first ever MLS Cup". The Guardian. Archived from the original on December 11, 2016. Retrieved December 10, 2016. ^ "MLS Cup 2016: Toronto FC vs. Seattle Sounders FC". Major League Soccer. December 10, 2016. Archived from the original on June 25, 2018. Retrieved June 24, 2018. ^ a b c Hill, Tim (December 10, 2016). "Seattle Sounders win the MLS Cup after penalty shootout – as it happened". The Guardian. Archived from the original on December 11, 2016. Retrieved December 10, 2016. ^ a b Larson, Kurt (December 10, 2016). "Toronto FC loses MLS Cup in heartbreaking fashion". Toronto Sun. Archived from the original on December 11, 2016. Retrieved December 10, 2016. ^ Murray, Caitlin (December 10, 2016). "Stefan Frei won the MLS Cup for Seattle with some spectacular saves". Fox Sports. Archived from the original on December 13, 2016. Retrieved December 10, 2016. ^ Stone, Larry (December 10, 2016). "MLS Cup: First the agony, followed by the ecstasy for Sounders". The Seattle Times. Archived from the original on December 1, 2017. Retrieved November 29, 2017. ^ Wahl, Grant (December 11, 2016). "Stefan Frei's transcendent save sparks Seattle Sounders to first MLS Cup". Sports Illustrated. Archived from the original on December 1, 2017. Retrieved November 29, 2017. ^ Goff, Steven (December 11, 2016). "Seattle goalie's moment of magic raises a taut MLS Cup". The Washington Post. Archived from the original on October 1, 2017. Retrieved September 30, 2017. ^ Murray, Caitlin (December 14, 2016). "There's never been a comeback like the Seattle Sounders' in MLS". Fox Sports. Archived from the original on December 1, 2017. Retrieved November 30, 2017. ^ Baxter, Kevin (December 10, 2016). "Brian Schmetzer's Cinderella season in Seattle ends with a title". The Los Angeles Times. Archived from the original on December 1, 2017. Retrieved November 30, 2017. ^ Loh, Stephanie (February 8, 2017). "Seattle Sounders MLS title win voted Sports Story of the Year at the MTRWestern Sports Star of the Year Awards". The Seattle Times. Archived from the original on December 1, 2017. Retrieved November 30, 2017. ^ "Toronto FC repeat as Canadian Champions; earn berth in CONCACAF Champions League". Canada Soccer. June 27, 2017. Archived from the original on July 31, 2017. Retrieved August 7, 2017. ^ Davidson, Neil (December 1, 2016). "TFC, Sounders battle for team bonus and MLS Cup". CBC Sports. The Canadian Press. Archived from the original on December 14, 2017. Retrieved December 13, 2017. ^ Booth, Tim (December 1, 2017). "Sounders blast Dynamo to setup MLS Cup rematch with TFC". CBC Sports. Associated Press. Archived from the original on December 2, 2017. Retrieved December 1, 2017. ^ Baker, Geoff (December 9, 2017). "Sounders silenced as title defense falls short in MLS Cup rematch against Toronto FC". The Seattle Times. Archived from the original on December 14, 2017. Retrieved December 13, 2017. ^ "Thousands celebrate Sounders victory in parade". TSN. December 13, 2016. Archived from the original on January 2, 2017. Retrieved January 1, 2017. ^ McGrath, John (December 13, 2016). "30 years from now, we'll still talk about this Sounders' celebration". The News Tribune. Tacoma, Washington. Archived from the original on January 2, 2017. Retrieved January 1, 2017. This page was last edited on 20 March 2019, at 05:51 (UTC).